“Papa, when are you getting me out of here?” asks the small voice on the telephone. 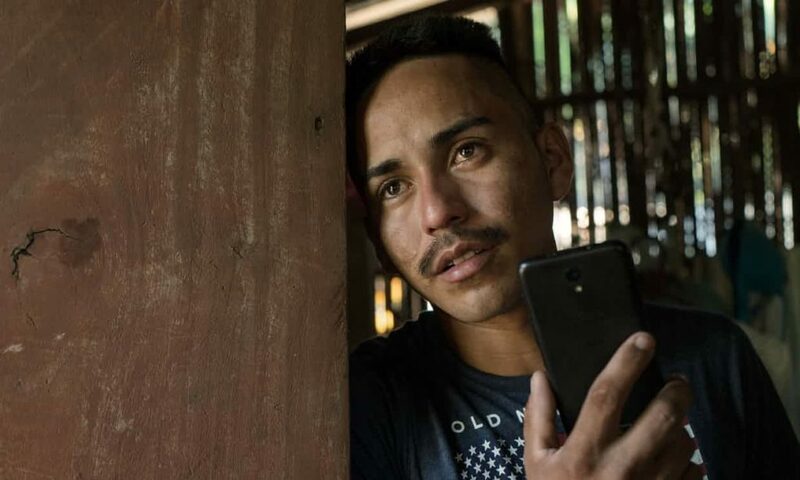 Arnovis Guidos Portillo holds his mobile phone away from his face as he struggles to hold back tears, but his six-year old daughter, Meybelin, can still be heard on speakerphone, asking when she will be released from custody in an American detention centre. Though he knows it’s a lie, he tells her that she can’t return to El Salvadorbecause the US government’s plane is broken; the truth is that he has no idea what will become of her. Portillo, 26, was separated from Meybelin in McAllen, Texas, on 27 May – over three weeks after the attorney general, Jeff Sessions, announced the Trump administration’s “zero-tolerance policy”, mandating children of undocumented migrants would be removed from their parents. Since then, 2,575 have been separated from their parents. He has spoken to her three times since he was deported to El Salvador on Thursday, but he has no answers to her questions. Donald Trump reversed the separation policy this week, but the US government has offered no plan for families to be reunited. According to the Department of Homeland Security, more than 2,053 children remain in foster care or shelters in the US. It is unclear whether Meybelin will be returned to her father. Portillo has been a single parent since he and Meybelin’s mother split up soon after she was born. He was holding his daughter’s hand when they turned themselves in to US border patrol agents in McAllen. He had hoped to ask for asylum, but says he was never given the chance before the pair were taken to a detention centre and he was charged with the misdemeanor of illegal entry. They were together for 24 hours before she was taken from him. Agents told him they would be reunited after his court date two days later. She never showed up. Portillo emerged from the reception centre for returned migrants at El Salvador’s capital San Salvador late on Thursday afternoon, dressed in the same dark blue shirt he’d been wearing when he fled home on 18 May. He embraced his girlfriend, Joanna Salinas, and piled into the back of a truck for the three-hour journey back to their village on the southern coast of El Salvador, where Portillo earns $7 a day growing corn for cattle feed and fishes on his days off. The windowless one-room house where he and Meybelin lived had been left untouched: her favorite white dress hung on a wire above her bed; her green bicycle leaned in the corner of the room. Portillo is talking to a visitor when the phone rings – it is Meybelin. “Hello, my love!” he says, his voice trembling with emotion. Gripping the phone tightly, he peppers her with questions: has she been given school work; has she gone to church; has she seen a doctor? “Meybelin, I love you,” he says. After the phone call, Portillo sits on his daughter’s bed with his head in his hands and wipes his face with his T-shirt, which is emblazoned with an American flag. He starts to cry. “It hurts,” he says. Portillo and his daughter left home on 18 May with just a backpack holding a colouring book and a change of clothes. It was the second time he had fled to the US – both times after death threats from the gangs that dominate his hometown. Since the end of its 1980-92 civil war, El Salvador has been ravaged by a horrific conflict between rival street gangs and the security forces. The country’s murder rate has dropped a little since it reached a peak of 104 per 100,000 citizens in 2015, but the violence has climbed again this year. Portillo paid a smuggler a down payment of $2,000 to take them north, to meet up with his brother in Kansas, where he planned to work for the remaining $6,000 fee for their passage. The gruelling journey to the border took nine days, and included 52 hours in the back of a freezing truck. They travelled with his brother-in-law and a friend, who were also with their daughters. 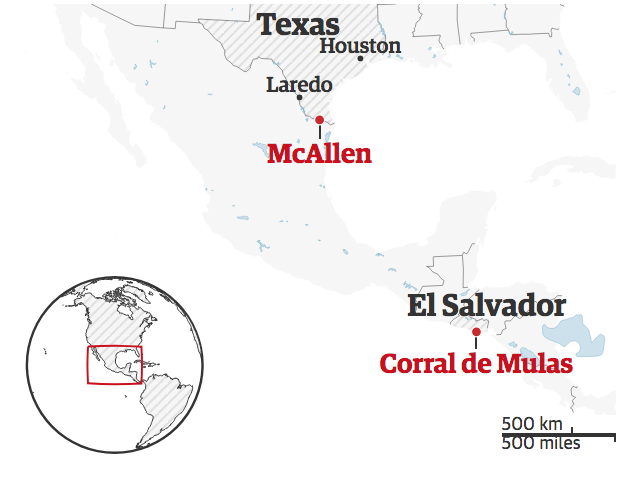 When they reached Hidalgo, the Mexican town across the border from McAllen, they crossed under the international bridge to dodge Mexican officials who would turn them back, in the hopes of finding US border agents to whom to hand themselves in and request asylum, he said. Portillo was transferred to an ICE detention center outside Laredo, Texas, where he was held for several weeks. He is unsure what became of the other two men, but he knows they too were separated from their daughters. Several other migrants with whom he was held had also lost their children. He describes seeing three agents hold a migrant down while another agent pulled the man’s child away. “All I hear is my daughter, crying. All I can see is her face when they took her – she was terrified,” Portillo says. El Salvador has said its consulate in the US is refusing to release the documents America needs to deport parents separated from their children at the border. But parents can ask to be returned without their children. Portillo says he eventually agreed to return on Tuesday after agents threatened him. “I signed because they hadn’t told me where my daughter was and they said they’d send her back to El Salvador right after me. They told me she’d stay detained until I signed the papers,” he says. On Saturday, he finally got an answer, when an American lawyer, Jonathan Ryan, called to tell him that Maybelin was being held in a shelter in Phoenix, Arizona, run by the Texas-based non-profit Southwest Key Programs. Ryan is the executive director of Raices, an organisation providing legal services to immigrants along the Texas border, and he told Portillo they had taken up Maybelin’s case. According to Ryan, US officials have become more willing to refuse migrants their right to apply for asylum. “The Trump administration has devolved much of the authority in these individual cases to officers who are handling them. It’s all totally uncoordinated – people on the ground are making it up as they go along,” he said. With little government help, advocates and attorneys have stepped in to fill the void. Raices has received more than $17m since the administration started separating children from their parents, and a host of other legal aid organisations have taken on some of the more than 2,300 cases. Since January, 7,167 Salvadorans have been detained as part of a travelling family, according to US Customs and Border Protection statistics. While the harsh measures may deter some potential migrants, many say they will keep trying to reach the US. “This policy won’t stop most people – especially those asking for asylum. Their lives are at risk. They’d rather deal with the consequences, even with a small chance of success, than be killed,” said Alberto Xicotencatl, the director of a migrant shelter in the northern Mexican state of Coahuila. Portillo’s girlfriend Salinas, 19, says she hopes Portillo flees again to avoid being killed. But he is unlikely to get asylum, after Sessions ruled that those fleeing gang violence would no longer qualify. According to Ryan, it is too soon to say what will happen to Meybelin, but Raices is working to reunite her with her father. Sarah Kinosian is a freelance journalist focusing on security, human rights, US policy and LGBT issues in the Americas. She is based in Mexico but also covers Central America. Kinosian… Read More.